Learn more about the human skeletal system. 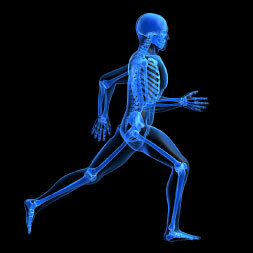 The human skeleton is an amazing and complex structure and is involved in vital functions such as supporting the bodily organs, providing points of attachment for the musculature system to allow movement, maintaining body shape, and protecting vital organs such as the brain and spinal cord. In this human anatomy course you will learn about the structure, development and function of bones within the human skeletal system. It outlines how bones develop from the fetal through to the adult stages of life. You will be introduced to the bones of the axial skeleton formed by the vertebral column, rib cage and skull. You will also learn about the appendicular skeleton formed by the pectoral girdle, the pelvic girdle and the upper and lower limbs. This human anatomy course will be of great interest to all healthcare professionals who would like to learn more about the human skeletal system and its biological functions, and to all learners who would like to learn more about the vital role it plays in maintaining human health. After completing this course you will be able to: - Describe the structure of the human axial and appendicular skeleton; - and explain the functions of the human axial and appendicular skeleton.